READY TO BECOME A TOP SPEAKER !? to improve ourselves personally and professionally and positively contributes to the lives of the ones around us. make a difference and a positive impact in our communities. Come and visit one of our meetings this year. We meet every Wednesday from 7pm to 8:45pm. Yes! I would love to attend one of your meetings. What is Toastmasters all about? For over 90 years Toastmasters has helped people to improve their communication and leadership skills. However, becoming a Toastmaster is much more than that. It is to become part of a community of over 300.000 people worldwide, always ready to give their best to support others in their growth. It is a self-learning system where you can learn as you go at your own pace. With Toastmasters you will not only become a great communicator and discover the true leader in you, but also will become part of an AMAZING family! Come and visit us! Our team will be happy to explain you all about the benefits of Toastmaster' educational program. Come and join one of our meetings every Wednesday of the month at 7pm in Zurich, Kreis 4. ​Please register to let us know you are coming. Click the image for more information about Toastmasters' Educational Program, and Toastmasters International. Come and visit one of our meetings. 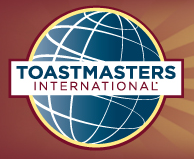 We would love to have you as a guest and explain more about the benefits of Toastmasters.